Today, just in time for WordCamp San Francisco 2008, Shiny New Toy is taking the wraps off a new website we’ve been working on: WP Screencasts. 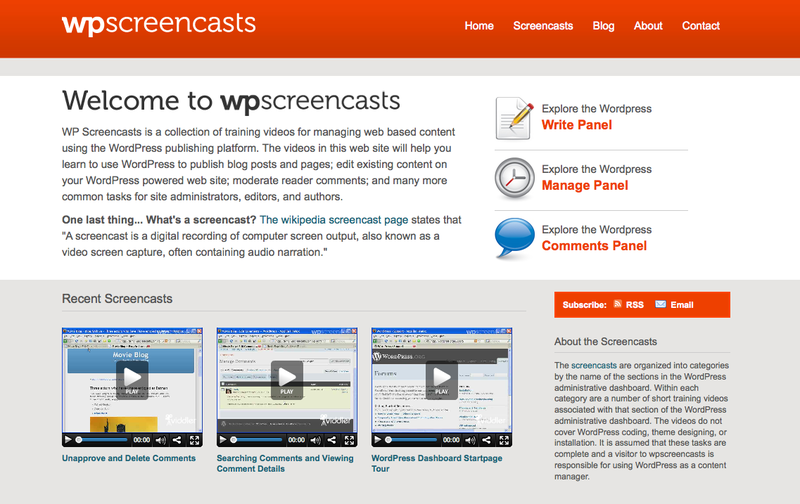 WP Screencasts is a compilation of instructional training videos for managing web content with the WordPress platform. If you are a current client of ours and we’ve built a site for you with WordPress, we hope that WP Screencasts will be a helpful reference in completing your daily and weekly web content management tasks. Similarly, if you happen to be a WordPress developer, designer, or consultant that is building WordPress sites for your own clients, please feel free to use that as a piece of your client training and education. Another reason we love WordPress so much is how much thought has been put into the user interface of the WordPress dashboard. We’ve encountered many web-based content management systems over the years and the usability of the WordPress admin screens outshines that of competing CMS packages. However, we continue to run into challenges with teaching content managers how to use WordPress to add, edit, and manage online content. It’s not that training users on WordPress is impossible, we’ve just found that different people learn in different ways. Some folks require a significant amount of hands-on training and we’re happy to provide that. Other folks do well with reading the information found in resources such as the WordPress Codex and books like WordPress for Dummies by Lisa Sabin-Wilson. What we found missing for WordPress users was a comprehensive set of video based training content for learning how to use administer content in a self-hosted WordPress based websites. WP Screencasts aims to fill that gap and complement WordPress learning resources already available on the web and in print. Our initial set of videos that we are launching with is just the beginning. We’ll continue to expand by adding additional screencasts over time. If there is a task that isn’t covered in a video here, let us know and we’ll do our best to include it in the future.